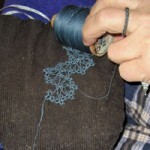 We had a fine day of meeting and making batts for our booth at Stitches. Images follow. If you missed the fun in January, you will still have a chance to play in February. 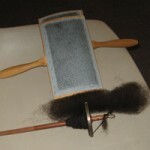 More batts will be made at the February meeting. Please bring your drum carders. Neither Sue nor Frank will be at the February meeting. Stitches signup! February 23-26. Ginger is running the signups this year. If you miss meetings, you can email gingeredighoffer@yahoo.com. There are still plenty of openings. Remember, working a shift gets you into the the market *FREE* on any day. 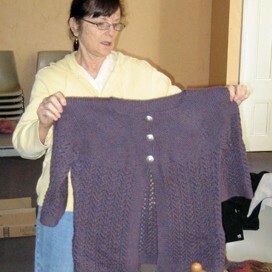 Sue found this class through the Yarn Harlot’s blog. Carson charges $100 an hour plus expenses. Since he lives in San Francisco, the expenses will be minimal. He’s willing to work with us if we want something different than his standard class. 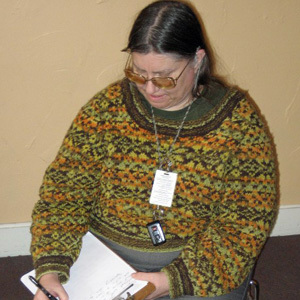 Aviva has the spreadsheet she made with the contact information of guild members. She will email it to the attendees at the January meeting. The presidents will print off copies and bring them to meetings. Treasurer’s report: $821.36 in the bank. Dues ($15) are due in January. When you submit your money, please attach a note as to what classes, workshops or other ideas you have as to what we should do with our treasury this year. If you miss Lotus at a meeting, you can send a check to her at P.O. Box 5, Mount Hamilton, CA 95140. 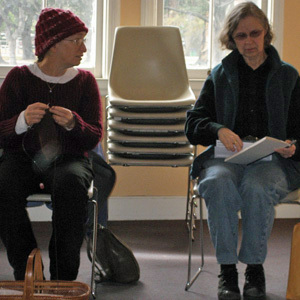 Announcement: CNCH (held next May in Oakland) has opened up registration for its classes. All of Judith McKenzie’s and some others are already filled. From what your intrepid newsletter editor has learned, Ms. McKenzie’s classes were filled within minutes of registration opening. Programs: Carol asked if we could coordinate with Blacksheep and see if we can piggyback on their programs. Sharolene attends other guilds and could be the liaison for us. Basket: Sue received email from a gentleman who wanted to give away a basket of his late wife’s tools. Since he only lived a couple of miles away, he brought it to the meeting for us. 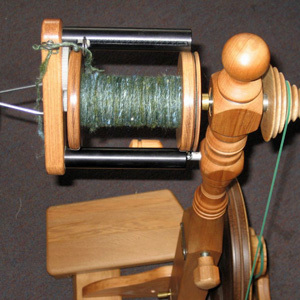 Frank: has been using his drop spindle to spin the black Lincoln (and Nancy) got from Don and Willow. He’s been spinning as fat as he can bear to. 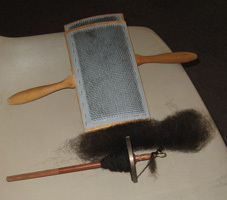 He’s hand carding and spinning a 2-ply. 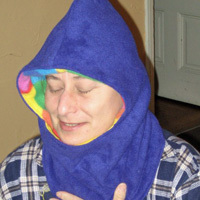 Sue: was just so terribly cold for a few days so she sewed a polar fleece balaclava. She brought tatting to do at the meeting but forgot to bring glasses so she could SEE what she was tatting. Therefore, no tatting was done. 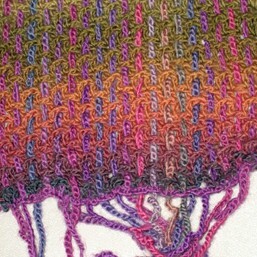 Carol: has mostly been knitting. 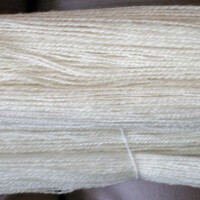 She brought a lovely, fine 2-ply that is about 900 yards of gorgeous, snow white yarn. It’s about 5,000 yards per pound. She was teasing some teal. 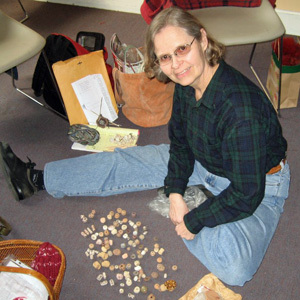 Nancy D.: brought a baggie of thimbles. 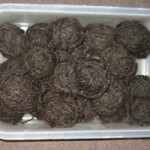 She got some solar dyed wool during the Holiday party. She’s working to prepare it. One of her young relatives is a cheerleader for the 49ers. We don’t normally have girlie pictures in our newsletter. This is the exception. The photo on the upper left is the girl without all the cheerleader make-up. 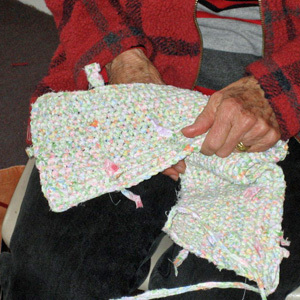 She’s working on a purse made from strips of cotton from an old dress. 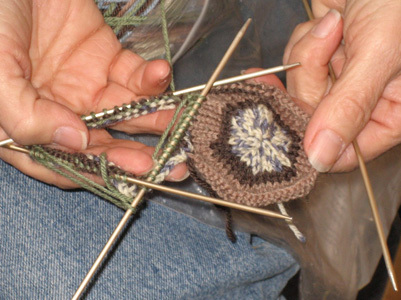 Lotus: is working on another potato chip sock. She chose the ceramic beads from the basket. 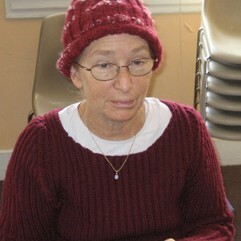 Aviva: knitted a bunch of hats from old yarn and wore the red one to the meeting. 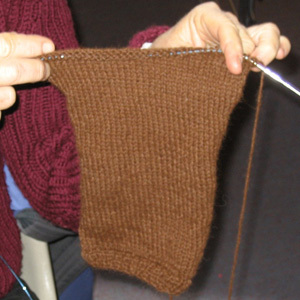 She’s knitting a brown vest. 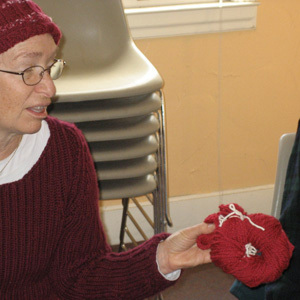 She bought some cochineal dyed merino at a Mendocino sheep event. She has 8oz. but realized after she swatched that she needs 20oz. so she’s spinning more. 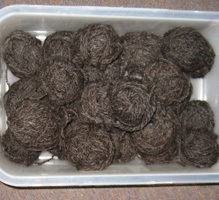 It’s very gratifying to spin a fatter yarn and go through lots and lots of fiber. 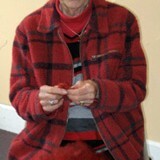 Sharolene: took a two part class on making jackets. She brought a sweater for S & T and a colorful scarf. 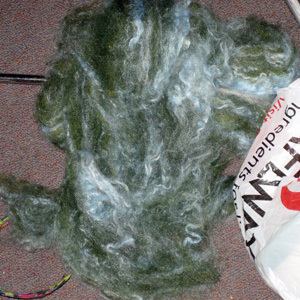 She’s spinning a green wool/silk blend. Ginger: brought the wrong thing to spin. She has a cat at home that is “helpful” and pulls plastic bags out. 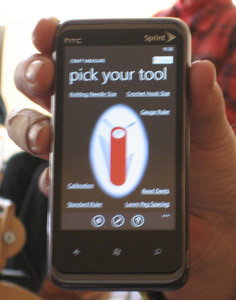 Her knitting calculator app is in the marketplace. 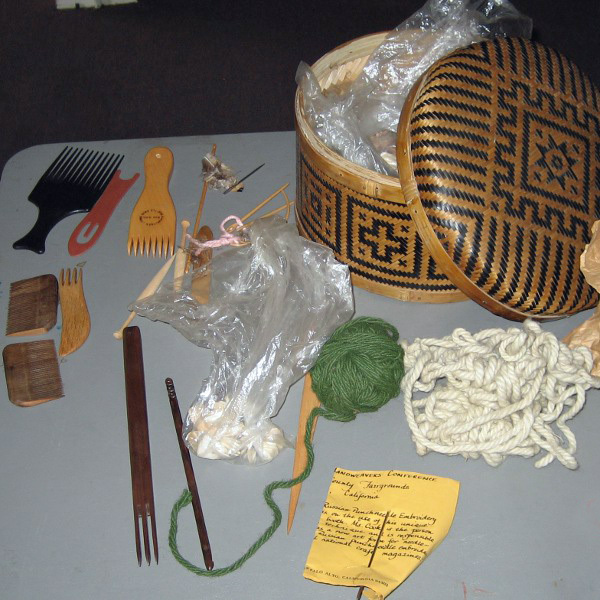 Her weaving calculator and measuring apps are in the works. Her website is at www.http://canitag.com. And that’s February in a Nutshell. This entry was posted in News & Views, Uncategorized on February 1, 2012 by webmasterANNE_serendipity.